The oldest part of Jakarta lies on the North West coast of Java where the Ciliwung river pours out into the Bay of Jakarta. 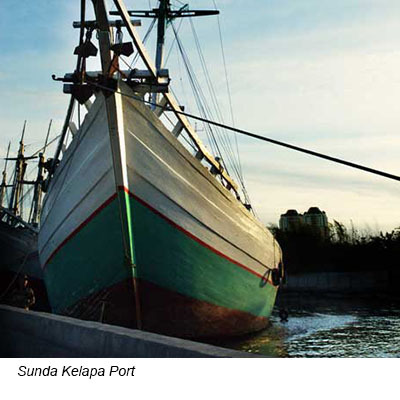 This harbour town was first known as Sunda Kelapa. But on 22 June 1527 Prince Fatahillah razed Sunda Kelapa and founded the town of Jayakarta on the same site. This is the date that Jakarta takes as the establishment of the city. Jayakarta was a thriving port where traders from China, India, Arabia and later the Europeans, as well as those from all over the archipelago exchanged their wares. 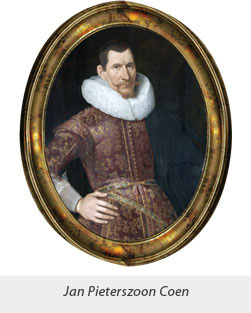 In 1619, the Dutch VOC under Jan Pieterszoon Coen destroyed Jayakarta and built a new town on the west bank of the Ciliwung river, which he named Batavia, after the Batavieren, the Dutch tribal ancestors. Batavia was planned similar to Dutch towns, in a series of blocks cut by canals and defended by a fortified wall and a moat. This part of Batavia was completed in 1650. Old Batavia was where the Europeans lived, while the Chinese, Javanese and other indigenous groups were relegated outside the city entrenchment. In its heydays, Batavia became known as the Jewel of the East, the seat of the VOC and later it became the seat of the Dutch Government over the sprawling East Indies archipelago. During the Japanese occupation in 1942, the Japanese again changed the name from Batavia to Jakarta. On this 1.3 square kilometers of land, - today part of north and west Jakarta, - is where the Dutch built a fortress, a city wall, canals and administrative buildings. Center of Old Batavia was the Municipal Hall, known as Stadhuis, fronted by a large plaza, known as Stadhuisplein, that has a fountain in its center that supplied water to the surrounding buildings. Today the plaza is called the Fatahillah Square and the Stadhuis has become the Fatahillah Museum which houses the complete history of the growth of the city of Jakarta. Around the square are important buildings. On the East side was the Court of Justice, which is now the Museum of Fine Arts and Ceramics. 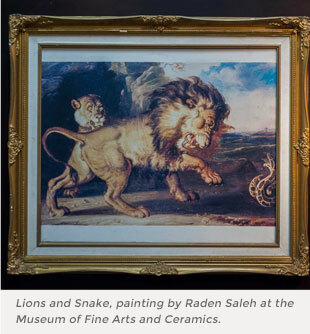 Here you will find paintings of Indonesia’s maestro painter Raden Saleh as well as those of the more contemporary painter, Basuki Abdullah, Affandi and more. To the west you can find the Wayang Museum that was once owned by the large Dutch company Geo Wehry. Nearby is the Kota Railway Station, also known as the Beos Station. This is an art deco building, which continues to be in use and still retains its original architecture. While to the north are a number of commercial buildings which now house the Museum Mandiri and the Bank Indonesia Museum. 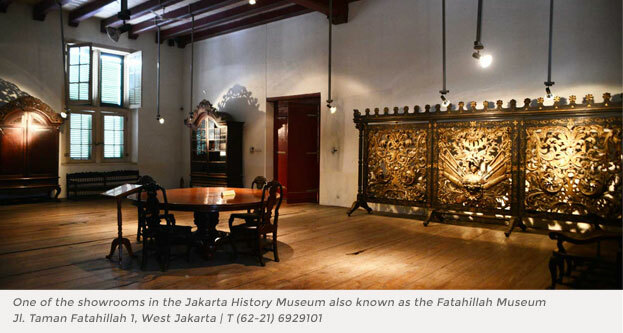 Also known as the Fatahillah Museum in the Old Batavia district, the Museum follows the history of Jakarta. Originally built in 1707 as the Stadhuis, or the Municipal Hall of Batavia, the building now houses the history of the city of Jakarta from prehistoric times until today, in metals, textiles, stones, crystal, ceramics, paperand bone. Here is the “Jagur” cannon, believed to enhance fertility, the axe used for beheading of criminals, paintings of consecutive Dutch Governor Generals from 1602 – 1942. Here there also original antique colonial furniture once used by the colonial powers. The Museum has a dark and scary dungeon that was once a prison, where at one time Indonesia’s National Hero, Diponegoro, was imprisoned and chained. The Wayang Museum is also located at the Fatahillah Square. “Wayang” are the typical stylized Indonesian puppets that draw their tales from the Hindu epic poems the Mahabharata and the Ramayana as well as relate the feats of ancient Javanese kings in destroying their opponents. 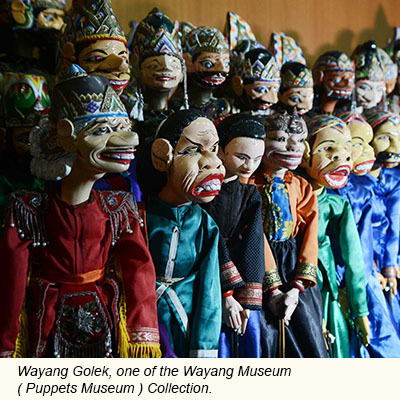 While “wayang” is a way of popular story-telling yet it is a sophisticated art form that conveys deep philosophical thoughts and learnings.For this reason Wayang has also been designated a UNESCO World Heritage. Most well known are the finely crafted leather puppets that are used for shadow puppet performances, but in this Museum you will find all kinds of puppets from different parts of Java. There are the wayang golek puppets from West Java, These are wooden puppets played by the “dalang” or the story teller, who changes his voice and intonations following the character in action, whether male or female, king or commoner. 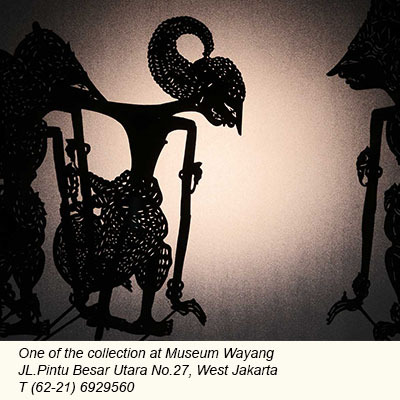 Wayang can also be performed by human actors, in which case it is called “Wayang Wong”. Here are also masks, wayang beber, Wayang Revolusi, Wayang Suket and more, totalling some 5,500 items. The Museum also has a collection of puppets from different countries, from China, India, Thailand, Cambodia to France and Suriname.The oldest in the collection is the Wayang Kyai Intan created in 1870. Still at the Fatahillah Square is the Fine Arts and Ceramics Museum. Here are displayed a collection of rare paintings by Indonesia’s maestros like Raden Saleh, Affandi, Basoeki Abdullah, S. Sudjojono, to contemporary Dede Ero Supria and more. 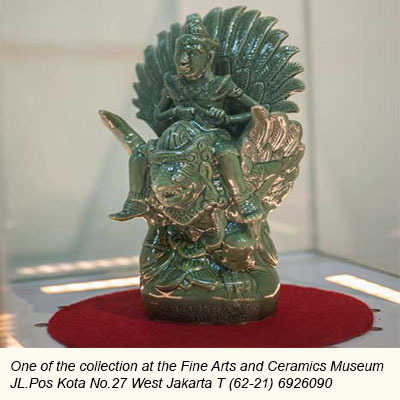 There are also collections of ceramics and sculptures by G. Sidharta. If you are interested in Banking, then visit the Bank Indonesia Museum and the Bank Mandiri Museum also around the Square. In the Bank Indonesia Museum you can follow the history of the archipelago’s Banking system from Dutch colonial times to today. 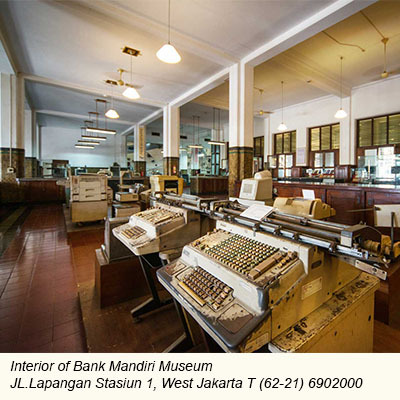 While the Bank Mandiri Museum shows how a private bank was run in the old colonial days. A mural shows the four seasons in Europe and a Dutch Captain, named Cornelis Houtman. The building itself has still retained the aura of the good old days, where ceramic mozaic floors are still in place in the lobby, the meeting room and offices of the bank directors. On the west and east banks of the Ciliwung was the commercial area known as Kalibesar, or in Dutch colonial days known as Grootegracht, or the Large Canal. Until today this is still a busy trading district, also known as Jakarta’s Chinatown. 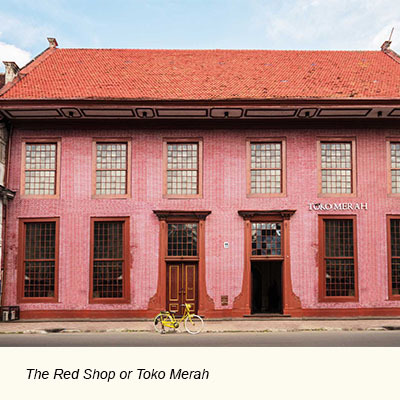 The Red Shop or Toko Merah from the 18th century used to be the Standard Chartered Bank. 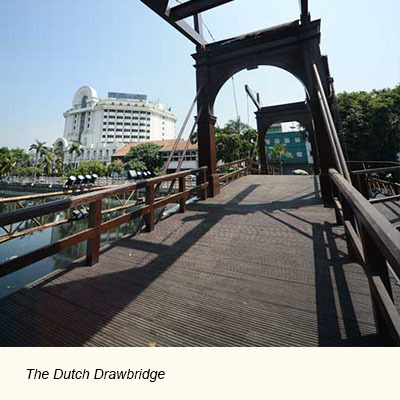 Close by stands a typical Dutch drawbridge, the only one left in Jakarta, that was once called the Engelse Brug or the English Bridge, connecting the Dutch fort with the British Fort. Facing the sea is an old look-out tower to watch incoming and outbound vessels. The tower is surrounded by a fortress. 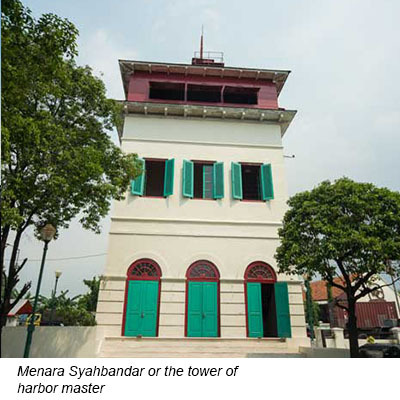 Today the tower is called Menara Syahbandar or the tower of the harbor master. Nearby is the Maritime Museum that was once large warehouses where lucritive spices were stored to be further shipped and sold in far away Europe. In the neighbourhood is the Fish market, known as Pasar Ikan, and at the mouth of the Ciliwung river is the Sunda Kelapa Harbour, which until today still serves as Jakarta’s traditional inter-island shipping. The Sunda Kelapa harbour is a favourite haunt for tourists to take photographs of the many traditional phinisi schooners tied along the pier. The elegant red brick National Archives Museum - known as Museum Arsip Nasional, is located on busy Jalan Gajah Mada. 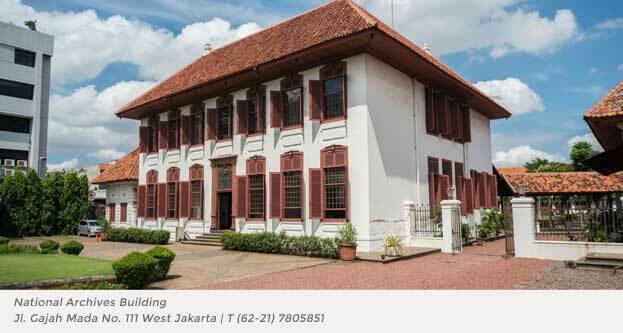 It once housed the Dutch colonial Archives, and was originally built in the 18th century as residence of the Dutch East Indies Company’s (VOC) Governor General Reinier de Klerk. 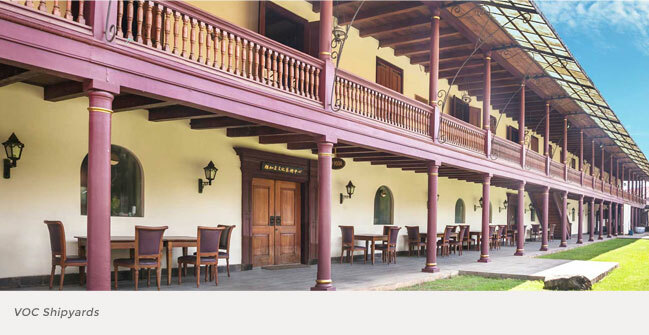 Today, however, it has become a museum which is open to the public and can be used for romantic gala dinners or wedding receptions in exclusive heritage setting. When the site was about to be demolished, a group of Dutch businessmen founded the Stichting Cadeau Indonesia (Society for the Gift to Indonesia) to collect funds to restore the building as a museum to donate this to the Indonesian government on the country’s 50th Independence Day in 1995. Restoration was however, completed only in 1998. The main red brick bulding has two floors with a high roof. It has a wide ground floor. Its main door is beautifully carved and has holes for ventilation. Here was the main drawing room of the governor general. Today there are still a collection of antique furniture and an arsenal of guns. On the ground floor can still be seen ceramic tiles similar to those found in the Palace of the Kasepuhan in Cirebon, depicting stories from the Bible. A staircase leads to the private quarters on the upper floor where offices and a dining room are (where Hillary Clinton was hosted a dinner during one of her visits to Jakarta). Here one can see old maps of Batavia, and the bedroom of Governor General Reinier de Klerk. In 2001 the National Archives museum received the UNESCO Award of Excellence 2001. With the growth of the city, the Dutch expanded Batavia further south to present-day Merdeka Square – then called Koningsplein around which today stand the Merdeka Palace,the Supreme Court of Justice,the National Museum and many important government offices including the office of the Governor of Jakarta as well as the American Embassy. In the center of the Merdeka Square now stands the National Monument, an obelisk-shaped needle on a large platform, dedicated to the historic Struggle for Independence of the Indonesian people. 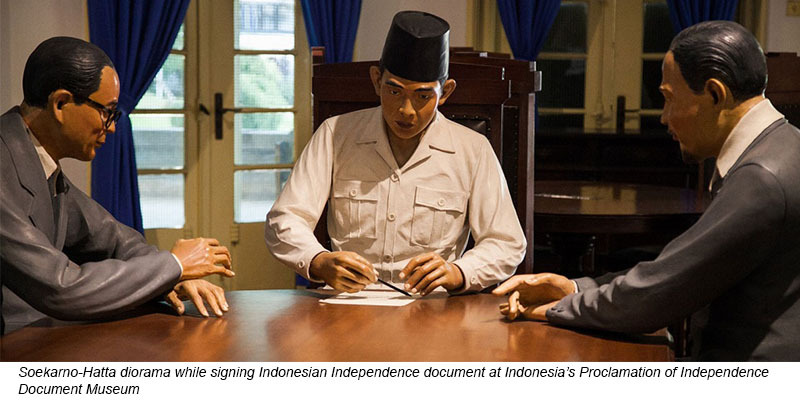 Below is the museum of the History of Indonesia’s Independence. The actual site where the historic Proclamation of Independence took place on the 17th August 1945 is on Jalan Proklamasi in the Menteng area. Here stands a statue of the Declarators of Independence, Soekarno and Hatta. On this site once stood the residence of Soekarno, Indonesia’s first President, but which has been razed and now stands a five storeyed building once dedicated to the Grand Development Design of the Republic of Indonesia. The National Monument stands proudly in the center of the 1 square kilometer Merdeka Square, symbolizing the hard-fought struggle of the Indonesian people to gain their Independence. 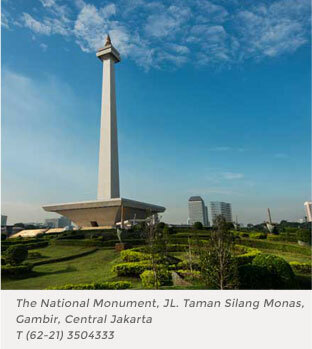 Obelisk-shaped and covered in white Italian marble with a golden fire on the top, the Monument is 132 meters tall and stands on a platform which houses a museum and diorama encapsulating the history of the Republic of Indonesia. The golden flame is 14 meters high with a 6 meter diameter. Made of bronze weighing 14.5 tons, it is covered with 50 kg of pure gold leaf. Its base is a platform at a height of 115 meters, which can be reached by elevator and is a perfect look-out place to see the Jakarta skyline. The Monument is surrounded by a green park where spotted deer can be seen grazing. There is also a musical fountain that plays each Sunday night. 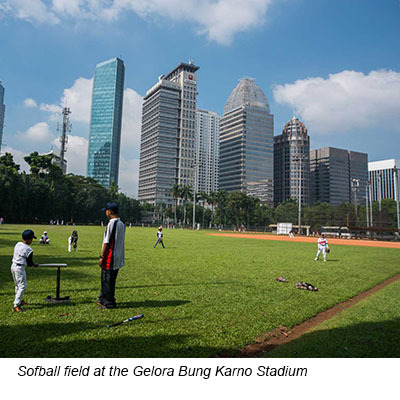 On Sundays, the area becomes an open park where Jakarta’s inhabitants are free to bike, jog and play games. The Monument is often used for Festivals including New Year’s Eve celebrations. The National Monument was designed and built in 1961 by Indonesian architects and engineers Soedarsono, Silaban and Roosseno. On the North side facing the Merdeka or Freedom Square stands the Merdeka Palace with adjoining Presidential Offices and State Secretariat buildings. Behind the Merdeka Palace but still within one complex is the Negara Palace (State Palace) which faces the other side towards the Ciliwung river along Jalan Juanda. In addition to a building for special guests, and Highlight of a visit to the Museum is the Gold and Jewelry room where are found precious crowns, ornaments, keris and jewelry once worn by royalty and the aristocracies around the archipelago. The National Museum has recently been expanded to make room for better displays. The Office of the Governor of Jakarta is situated on the South side of the Merdeka Square, at Jalan Medan Merdeka Selatan No. 9, adjacent to the Office of the Vice-President and the American Embassy. In 1905 the Batavia Municipal office was located in the Stadhuis, the present Jakarta Museum at the Fatahillah Square. 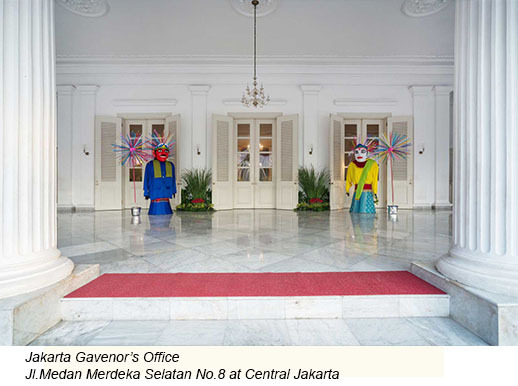 However, in 1919 the office was moved to the building which has now become the office of the Governor of Jakarta. In 1982 a highrise building was constructed right behind the Governor’s office facing Jalan Kebon Sirih, which houses the Jakarta’s Provincial Parliament. 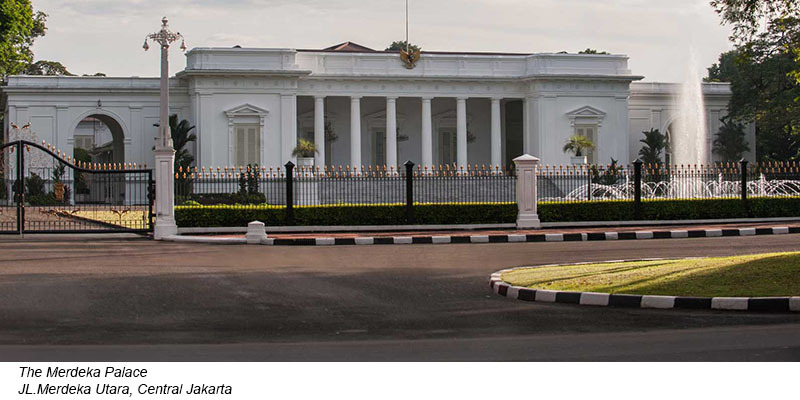 The Jakarta Governor’s office andthe Jakarta Provincial Parliament building are therefore adjoining. in front of which stands the Ministry of Finance, which was originally built as the Palace for Governor General Daendels. Around the square is the Catholic Church with the century old Sancta Ursula girls school attached. Opposite the Catholic Church is Jakarta’s iconic Istiqlal Mosque. On Banteng square is the statue symbolizing the liberation of West Papua from Dutch colonialism. From the Banteng Square down the Pejambon street is today the Ministry of Foreign Affairs and nearby the Dutch built grand Imanuel Protestant Church, where opposite stands the Gambir Station. Further down Jalan Merdeka Selatan comes the Menteng area, which was once the residential area of the Dutch elite. 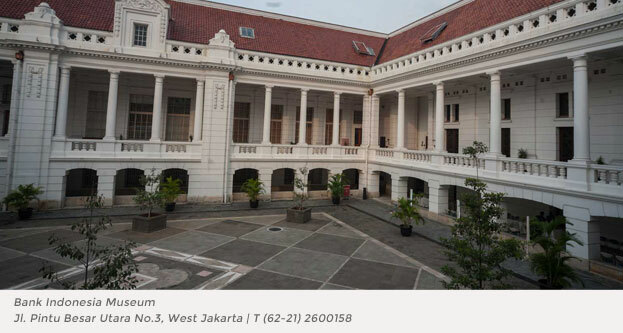 The Menteng area is now a conservation area, where no houses may be altered without special permit, and therefore it remains an upmarket residential part of town where colonial houses with manicured gardens are. The grand Istiqlal Mosque of Jakarta, was inspired by Indonesia’s first President, Soekarno, but took 17 years in construction. Finally on 22 February 1978, Indonesia’s second President, Soeharto inaugurated it as the country’s national mosque. The Istiqlal mosque is the largest mosque in South East Asia both in structure and capacity, as it can accommodate congregations of up to 120,000 people. 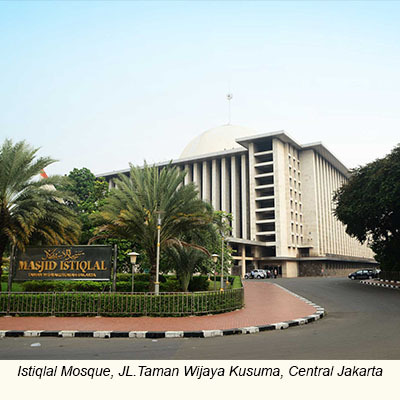 Located at Jalan Taman Wijaya Kusuma in Central Jakarta, on the north eastern corner of the Merdeka Square, the Istiqlal Mosque stands out with its 45m diameter dome and tall minarets. Standing almost right across the old Catholic Cathedral at the corner of Jalan Lapangan Banteng, the Istiqlal mosque was designed in 1954 by Frederick Silaban, a Christian architect from North Sumatra. The mosque has a large rectangular prayer hall with a 45 meter diameter dome supported by 12 round columns, and has 4 levels of balconies. Its interior is mostly simple. In his brief 18 hours visit to Indonesia on 9th and 10th. November 2010, US President Obama and First Lady Michelle Obama made a special visit to the Istiqlal mosque. Later President Obama praised the Istiqlal Mosque as a symbol of religioustolerance which characterizes Indonesia and Indonesians, inspiring the world. 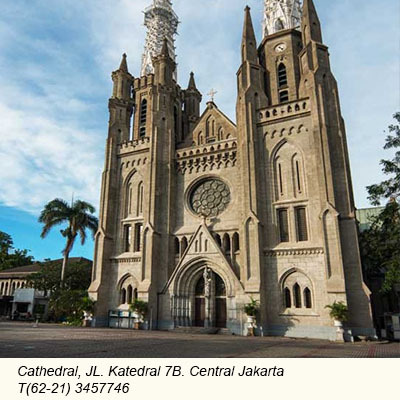 Jakarta’s neo-gothic Roman Catholic Cathedral stands on the north corner of Lapangan Banteng, or Banteng Square which was formerly called Waterlooplein, or Waterloo Square in Central Jakarta. Next to the Cathedral is the hundred years old Sancta Ursula Girls School. Today, the Cathedral stands right across Jakarta’s largest mosque, the Istiqlal Mosque. Their proximity is no coincidence, since Indonesia’s first president, Soekarno, chose the site on purpose, to symbolize the nation’s philosophy of unity in diversity, where all religions co-exist in peace and harmony. Today, both establishments continue to cooperate with one another, especially to accommodate the parking of cars during religious festivals. The parking lot of the mosque is used by the church congregationduring Easter and Christmas midnight mass, and vice versa, during Eid prayers, parking is extended to the Cathedral’s parking lot. The Cathedral was consecrated in 1901 having been rebuilt at the same location where previously stood the old cathedral, which was built in 1829 but collapsed in 1890.Above the church are three wrought iron spires, the two highest are 60 meters tall, while the central spire is 45 meters.The building itself has two floors, with the ground floor being for the holding of mass. The upper floor used to be for the choir, but has now been converted into a museum, which holds relics for rituals during the days of the Dutch East Indies, as also the history of the spread of Catholicism in Indonesia.The Cathedral is still actively used to this day. 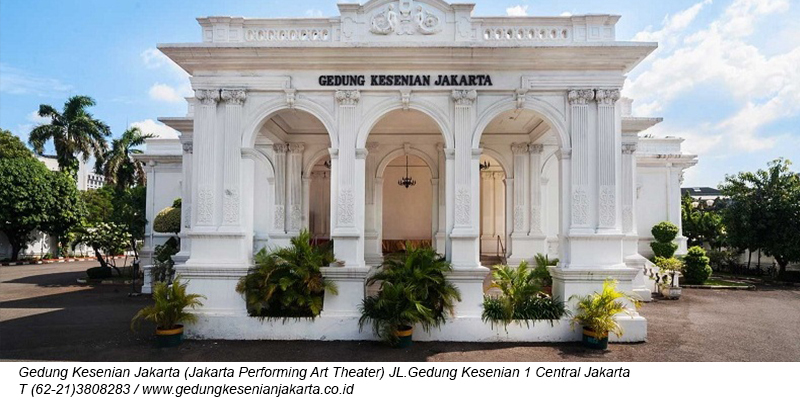 Gedung Kesenian Jakarta was built in 1821 upon the site of a simple theatre that was constructed during the British interregnum under Governor General Sir Stamford Raffles. At first called the Schouwburg, its first performance was Shakepeare’s Othello. In the following decades the building was used for different purposes. History notes that in 1926 the National Awakening Movement held their first Kongres Pemoeda, or Youth Congress in this building. In 1987 it was restored and the building returned to its original purpose as a theatre for concerts and performances. It has a capacity for an audience of 475 persons, and a stage measuring 10.7x14x17 meters. 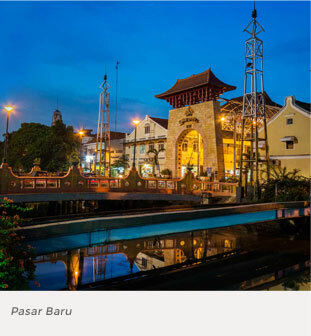 Opposite Gedung Kesenian is a shopping street known as Pasar Baru, that used to be most popular with the rich Dutch colonial elite. The street that has shops on both sides, is now only open for pedestrians. Most popular in Pasar Baru are the Indian Bombay textile shops, that have sold exclusive Indian textiles for decades. 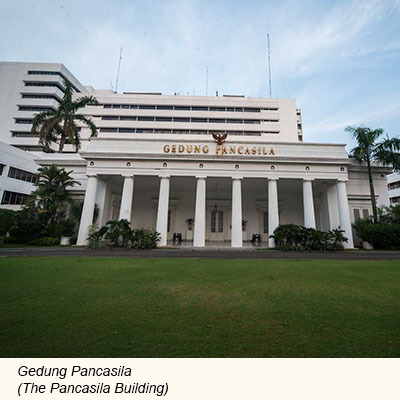 Today known as the Ministry of Foreign Affairs at Jalan Pejambon, the building is also known as Gedung Pancasila. This is where on 1 June 1945, a month before Indonesia declared her Independence, Soekarno presented his speech entitled: The Birth of Pancasila. This building was constructed in the 1830’s in the classic empire-doric style. It housed the Volksraad or Raad van Indie, the peoples’ representative institution of the time. Between 1942-1945 it housed the Committee for the Preparation of the National Constitution. 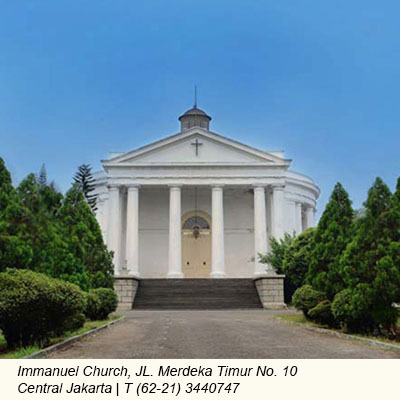 The Protestant Immanuel Church facing Jalan Merdeka Timur and Gambir train station, belongs to one of the oldest churches in Jakarta. Built in 1834, it was designed in neo-classical style during the reign of King Willem I of the House of Orange, and was therefore called the Willemskerk. The dome-shaped church contains an old Dutch organ made in 1843. The church is still in use until today. Serious construction of Modern Jakarta was started by Indonesia’s first president, Soekarno, who built the wide avenue connecting the Merdeka Square with the then new residential town of Kebayoran. This avenue was earnarked exclusively for highrise buildings. And so today, one sees only tall buildings on the Sudirman-Thamrin 6 lanes avenue. President Soekarno, who was a civil engineer by education, also built the National Monument and the Istiqlal Mosque. Indonesia’s first highrise hotel, the Hotel Indonesia – now Hotel Indonesia Kempinski - was also built then, as was the Wisma Nusantara across this iconic Hotel Indonesia round-about fountain, today popular sites for political demonstrations. Soekarno also built the Bung Karno Sports Center at Senayan, where the entire complex was earlier designed as a huge Olympic-sized village. Today, though, the Senayan area also has five star hotels, the Jakarta Convention Center, shopping malls and Television stations. While the Sports Center is often used for super gigs where international celebrities perform for immense crowds. The Hotel Indonesia Circle is today’s heart of the metropolitan city of Jakarta. 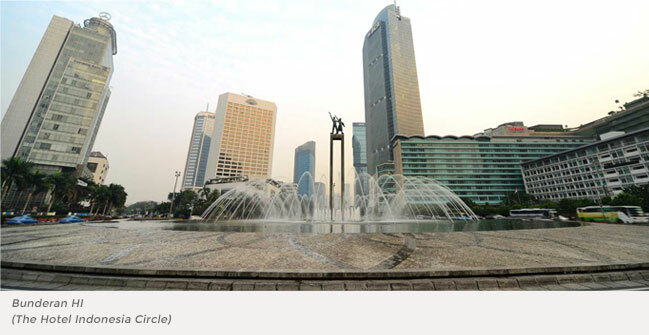 Consisting of a refreshing fountain and the Welcome to Jakarta Statue, this roundabout connects the 19th century Menteng area with 21st. century Jakarta with its modern skyscrapers, toll roads and wide avenues along Jalan Thamrin-Sudirman. 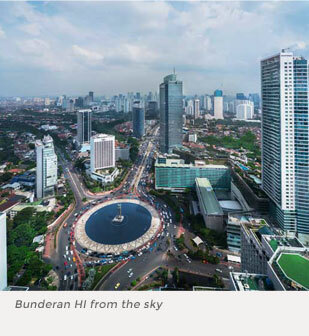 Around the circle are large hotels, supermalls and banks welcoming visitors in grand style to Indonesia’s capital city. The original Hotel Indonesia, from which this circle derives its name, has been revamped, extended and raised, and is now the Hotel Indonesia Kempinski with adjoining Grand Indonesia mall and the tall BCA Tower, now one of the tallest buildings in the city. Opposite is the Grand Hyatt with the equally grand Plaza Indonesia, shopping center for the elite and international visitors. Behind these two buildings is the famous Tanah Abang Textile wholesale area, and the Thamrin City mall. On the other side is the Wisma Nusantara building, Jakarta’s first highrise building built by the Japanese with war reparation. Today, Bunderan HI is the center of the city. On Jakarta’s Car free days, the Circle is closed to all vehicles and becomes the favorite spot for community sports, cycling, jogging and family recreation. 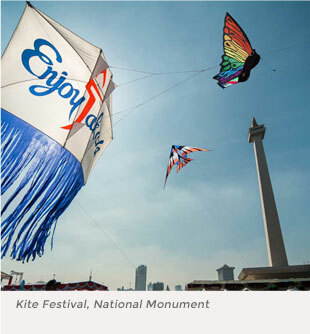 On Jakarta’s anniversary celebrations Bunderan HI with its Welcome Statue is filled with musical entertainment for all to enjoy. President Soekarno also built the Bung Karno Sports Center at Senayan, where the entire complex was earlier designed as a huge Olympic-sized village. 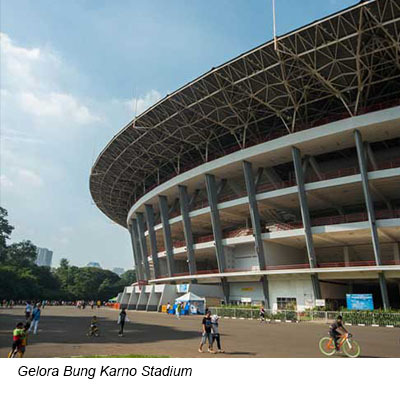 The Senayan complex houses the large Gelora Bung Karno Stadium and many sports facilities for tennis, archery, golf, swimming and others. Today, though, the Senayan area also contains the Jakarta Convention Center, five star hotels shopping malls and Television stations. While the Stadium and other Sports facilities are often used for super gigs where international celebrities perform for immense crowds. 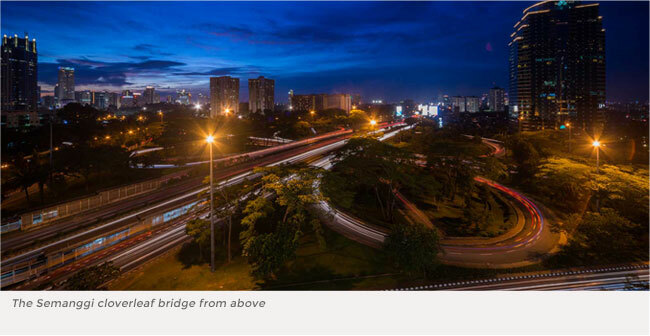 The Senayan and the Semanggi Cloverleaf Bridge were built for the 4th Asian Games held in 1962.